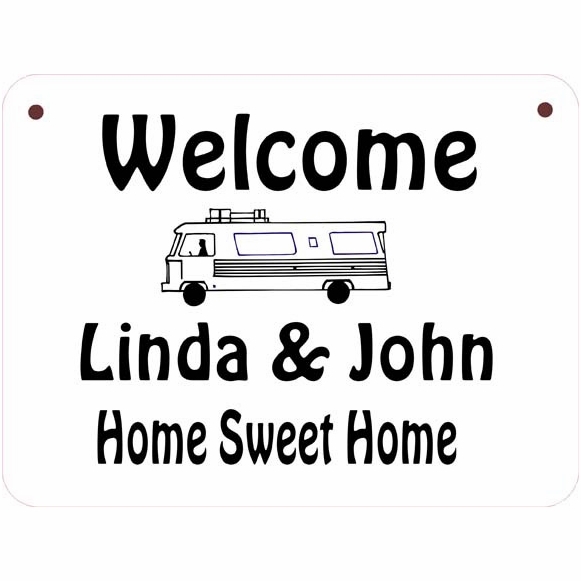 Personalized RV Name Sign - - personalized Welcome sign for your RV. Made in USA. For RV enthusiasts and those who travel with them. Perfect for identifying yourself and welcoming old and new campground friends. Personalize with your name, name of your RV, lot number in RV park or campground, or short slogan. The word "Welcome" and the picture are standard. Sign holds one or two lines of personalization. Line 1 holds up to twelve (12) 3/4" characters including spaces. Line 2 holds up to sixteen (16) 5/8" high characters including spaces. It is not necessary to use both lines. If not using Line 2, please leave the input box empty. Laminated acrylic rectangle sign with rounded corners and engraved personalization. Ready to hang on, in, or outside your RV. Includes 3/16" diameter fastener holes. Dimensions: 5.75" x 8" x 1/16". Color: white with black or ivory with brown. Personalized RV sign crafted made in America by skilled artisans to assure the highest quality.